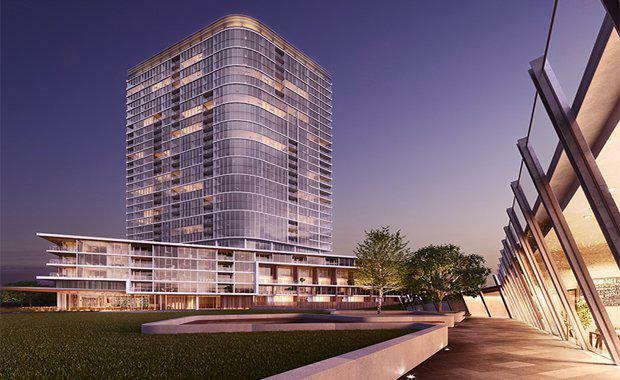 Construction of Mirvac’s $200 million Forge residential tower in Melbourne’s Yarra’s Edge riverside community has reached its final level. Located at the western end of the Wharf’s Entrance precinct, Forge’s form sculpted out of concrete, steel and glass will be one of the first sights visitors to Melbourne and residents will see when they cross the Bolte Bridge into Melbourne. The 30-level and 100 metre-tall building was designed to reflect the gentle rise and ripples of the surrounding water through its gently curved façade that brings a strong sculptural element to the precinct. It is the first tower to be delivered in the Wharf’s Entrance precinct, and it also represents the last chapter of Mirvac’s development parcel to be delivered at Yarra’s Edge. Mirvac Head of Residential John Carfi said Forge was designed to broaden the offering of the precinct both architecturally and socially. “The topping out of Forge is a significant milestone in this new landmark on Melbourne’s skyline,” he said. With over 75 per cent of apartments already sold, Forge is attracting a broad range of residents through a mix of apartments that appeal to different needs and life stages. To increase broader appeal to the precinct, Forge introduced an array of new apartment options to Yarra’s Edge including one and two-bedroom artist studios, one-bedroom lofts and two-bedroom maisonettes, to add to the expansive three-bedroom apartments ranging up to 151 square metres in size. Construction is expected to be completed early to mid 2017.